In an effort to expand my repertoire of card sketches that feature decorative paper backgrounds I decided to see if I could come up with a set of cards using four backgrounds cut from the same sheet of decorative paper. I trimmed my backgrounds and set about finding coordinating cardstock for my card bases. With that done it was just a matter of finding sketches that would work. 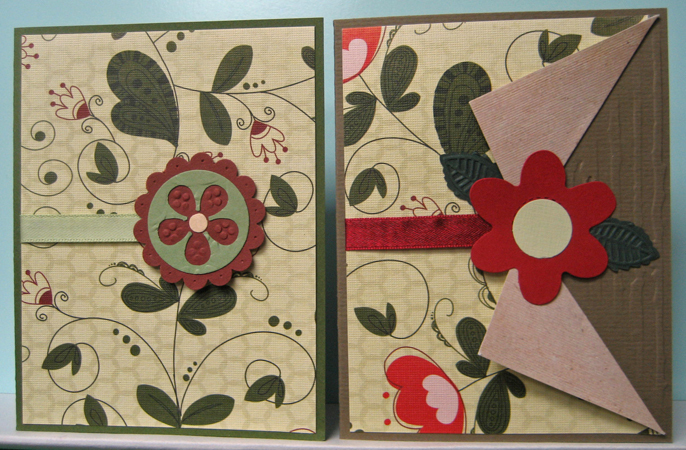 For my first card, I added a length of green ribbon and layered on a floral focal element which was constructed using diecuts/punchies. I die cut the petalled flower and manually embossed the petals before adding a green circle punchie and then an embossed pink center. I added a sponged laser printed punchie greeting to the lower left hand side to finish off my card. My second card started with the same background to which I added a dark maroon strip of embossed cardstock near the bottom. I die cut the word "happy"(SX) in green and mounted it to the left hand side of the maroon strip which left just enough space on the right for my little "birthday" which I fortunately was able to tuck under the maroon strip. For my third card I chose to cover the only bright red on my background with my layered focal element which gives this one a bit of a different look. I layered a green "hole" of a flower punchie over a maroon scalloped circle punchie and then embossed the petals before adding a pink circle punchie in the center to finish off the flower. I added a light green ribbon across the middle of the background paper before gluing it to my green card front then adhered my focal element over the end of it using 3D foam tape. The background paper details support the idea of the focal element being a flower. 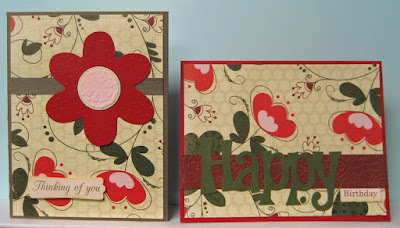 For my last card I decided to try a technique that I have seen quite a few times on Splitcoast Stampers which involves cutting the decorative paper on the center about one third way in on the right hand side. I measured 2 5/8" up and 1 3/4" from the edge of my 4" x 5.25" background and cut the paper with my exacto knife. Next, I scored between the end of the line and both corners so I would get a neat fold. I gently folded the flaps up and used a tiny piece of double sided tape very near the fold to keep the flaps from springing up too much - just enough dimension and texture!! I added a ribbon across the middle from the end of the cut to the outside edge gluing the ends to the back with double sided tape. The cardstock in the "v" needed a bit of something so I manually embossed that area with a distressed strips embossing folder. For my embellishment I die cut a small red petal flower, added a green center and two embossed leaves before adhering it over the end of the cut with 3D foam tape. Very happy with my challenge and did manage to find some sketches that worked with my backgrounds. I like that with these busy backgrounds I feel that the card don't really need greetings. My favorite is the one with the flaps - a great sketch. Will be using that one again! !